All right. You wanted one with no monkey business. Something that starts you out with a clean sound that's just got to be heard to be believed. Something that also takes you to that creamy sound you dig but doesn't force you to have an insurance policy that covers spilling beer in a 50's amp... Something that'd be great for a night bathed in blue, but works just as nicely doing a jazz set. Hmmm... Well, we think we've got just the ticket here. We've taken our signature first channel clean preamp, voiced it just right, and added a master volume just in case you need it. Nothing but your tone goes in here and comes out of that speaker. And with several power stage options, its got more than enough power to keep that mad drummer at bay too. 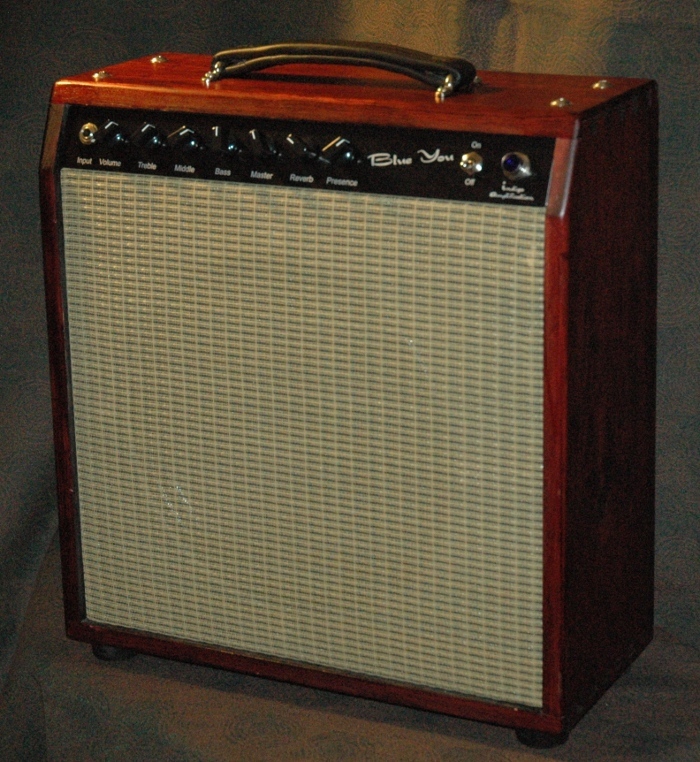 But what's really cool here is that the combo weight maxes out at about 22 pounds in our standard 50 watt configuration! The BlueYou. With a name that you'll remember and a tone that you'll never forget, it's sure to bring a simile to your face! Shown to the left, configured as a 50 watt, Eminence Lil' Texas loaded, 1x12 Combo. Weighs in at around 22 Pounds as a 50 watt combo!!! All our amps feature eyelet board construction on Military grade glass epoxy boards (Garolite G10/FR-4). We also use the highest quality teflon coated wire, metal film resistors, and custom speced caps. As for our cabinetry, it's all handmade; dovetail jointed and out of Poplar or Pine. More exotic woods are available on request.